You might think I’m going to discuss the newly discovered explanet around Proxima Centauri, but – no – that’s pretty much been done to death. Instead, I thought I might tell you about our paper that was accepted on the same day. Our paper is about the Kepler-20 system. In 2011, it was announced that the Kepler spacecraft had found 4 planet candidates in what is now known as the Kepler-20 system. The following year, 3 were validated (Kepler 20 b, c and d) and it was announced that there may also be two Earth-sized planets in the system. These two were confirmed (Kepler-20e and f) later the same year. The Kepler satellite uses the transit method for detecting exoplanets. This essentially looks for small periodic dips in a star’s brightness to infer the presence of an orbiting object. From this, you can determine the object’s radius, but not its mass. For that, you need to use the radial velocity, or Doppler wobble, method, which I discussed in this post. Some of the early studies did do some radial velocity measurements and did present mass estimates for a few of the planets, but they were not accurate enough to infer much about their composition. What we did was observe the system with HARPS-N. The observant among you may already have noticed that the figure above has 6 planets, not 5. Yes, we discovered one more. A ~20 Earth mass planet, located between Kepler-20f and d. It wasn’t found earlier because it doesn’t transit, so we don’t know the radius. However, given its mass, it is probably similar to Neptune. You may also have noticed, that the figure above also compares the orbits to that of Mercury; all 6 planets orbit closer to their parent star than Mercury is to the Sun. 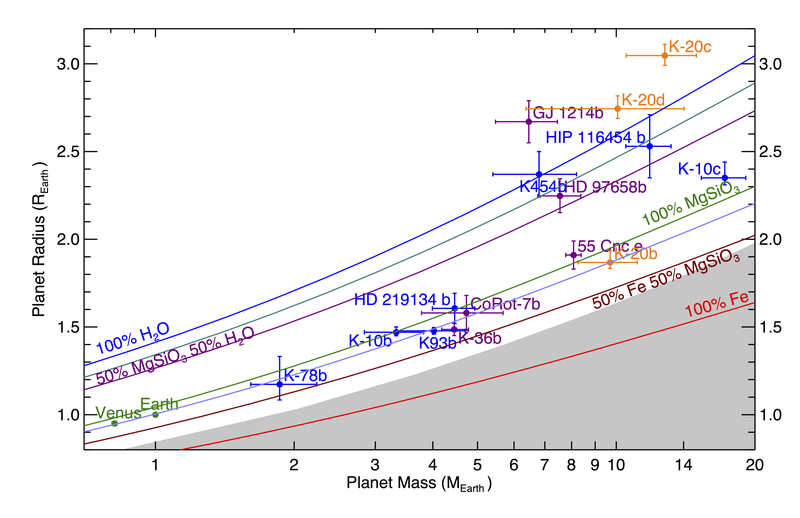 We also managed to get a more accurate estimate for the mass of Kepler-20b. It’s a ~1.9 Earth radius planet with a mass of ~9.7 Earth masses. This gives it a density of 8.2 g cm-3. If you look at the mass-radius relation figure on the left (Kelper-20b is the orange data point labelled K-20b), it lies on the same composition curve as the Earth and Venus. It is, therefore, the most massive rocky planet known. 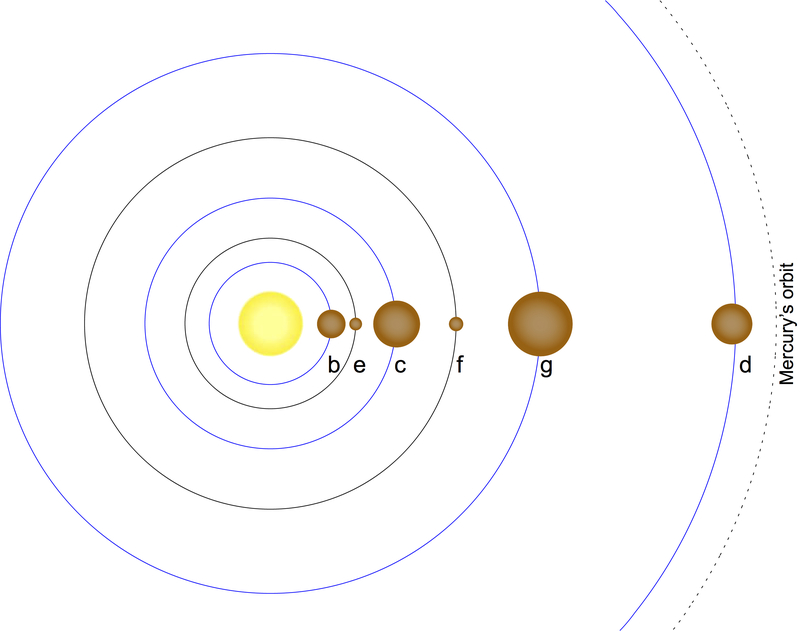 Recently, it’s been suggested that most planets with radii of 1.6 Earth radii, or greater, are not rocky. Here we have one that it 1.9 Earth radii, and apparently rocky. It is, however, orbiting very close to its parent star and, therefore, heavily irradiated. It’s possible, therefore, that this is a planet that once had a significant gaseous envelope that it has lost due to photo-evaporation; we are maybe seeing the bare core of what once was a gaseous planet. It is therefore still possible that rocky planets do not typically form with radii above 1.6 Earth radii. Anyway, that’s some of my exoplanet news for the week. Maybe not quite as exciting as the new planet around Proxima Centauri, but still interesting, even though none of the planets are potentially habitable (the host star is similar to the Sun) and even though it is almost certainly too far away to consider sending anything to visit the system 🙂 . This entry was posted in Personal, Research, Science, The scientific method, Universities and tagged Exoplanets, HARPS-N, Kepler-20, Lars Buchhave, Pale red dot, Proxima Centauri. Bookmark the permalink. 53 Responses to A new exoplanet! Another exoplanet? No. You already have plenty that you don’t even use. Yes! But a nice spinning one, not some beat-up irradiated hot one with no atmosphere. And I’m not that keen on gas giants either. But, Magma, surely all you need is a solid crust to be molten under ? People often talk about temperature and radiation to assess whether life is possible. Is mass of the planet a problem for life, organisms have to move, or just for humans? Do we know which mass range humans could adapt to? I think the mass mainly influences the atmosphere. If it’s too low, then the atmosphere will easily escape, partly because the escape velocity will be low enough that the a significant fraction of the atmospheric particles will be travelling fast enough to escape (unless they’re high-mass molecules, or elements – the Moon has a Xenon atmosphere) and partly because the planet will quite quickly lose it’s internal heat and, hence, magnetic field, and so will not have a magnetosphere to protect the atmosphere from a stellar wind. If the mass is to high, then the atmosphere is likely to be substantial (i.e., we think most planets with radii above 1.6 Earth radii have substantial gaseous envelopes). So, that would probably mean that anything below ~half an Earth mass will lose its atmosphere, and anything above something like 3 Earth masses will probably have too substantial an atmosphere. You’re probably just finding planets because you get finding to find planets. There’s clearly an imbalance in funding…how many studies that focus on NOT finding planets are funded? I want to see all your code and all your data. Don’t forget, the easiest person to fool into thinking that you found a planet is yourself. Perhaps you should put together a team along with scientists who are convinced that there are no planets out there. How else can I trust your findings? Have your findings been replicated? There’s a replication crises and the public doesn’t trust you. You say there are six exoplanets, but the highest unique ID in your database is “G”, so I am going to write a comment paper pointing out this discrepancy and not listen to any third party that explains it to me before I submit the comment. Since we’re all having fun at the expense of ATTP’s interesting research, I think someone should get serious for a moment. For the sake of science. But not me, yet. dikran – be careful what you say. That might be enough for Beetlejuice to show up on the thread…. You say planet. I say flying monkeys. Prove me wrong, then we’ll have a duel. Victor, assuming other conditions are right for life, gravity probably does not make much difference to single cell organisms, and may well not make much difference to aquatic species. It may well make a large difference to organisms equivalent to trees (which I presume would be short, squat with small branches, probably having an acute angle from the trunk) in high gravity world, and may entirely prevent the development of land vertebrates, and be very restrictive of the development of flight. Magma, your link goes to one of the best 404 pages I’ve ever read. I was sure that Gavin Schmidt personally sent the takedown notice himself, but I did some digging and found the correct URL. Still, it’s a clear case of federal budget bias. Moving humanity to a new planet is simply the best method of adaptation. We have the best new spare planets. You’d love them. Anders, well done and congrats. Indeed, I’m pretty far down the planet-naming pecking order. I’ve heard that for earth like planets, the initial atmosphere might be removed by large impacts early in their formation history, then delivered by comets later on. So a bigger terrestrial planet inside the ice line might avoid having too large an atmosphere. Of course, since radiometric heat generation goes as the cube of the radius and surface area as the square, volcanic activity and tectonics should be a lot more energetic on a bigger planet..
Possible, but I think the current view is that the bigger planets will initially have a much more substantial atmosphere and so its removal by comets may be more difficult. Indeed. Even if something more than 1.6 Earth radii could be rocky, it would take much longer – compared to the Earth – for the internal heat to reduce to the point where this activity presented less of a risk to life. But I would like to get a ruling on whether you have an unfair advantage in that you have posted comments at Cliscep. That’s why I try not to comment there, but I thought that maybe you could do better than me? Marco, thanks for the link. Once you think of it it is obvious, but I never thought of the importance of gravity for convection and thus for heat transport (cooling). Fascinating. Eli: Perhaps a small continent? That star is already known to have a planet – 16 Earth masses in a 40 day orbit. The star, however, has the same mass as the Sun and so the habitable zone will be similar to where it is around the Sun (at about 1 AU). A rocky planet at 1AU around a Sun-like star induces a radial velocity in the star of about 10 cm/s and the period will be about 1 year. We don’t yet have the sensitivity to detect such a small radial velocity. Thanks. Another thought. People seem to generally assume aliens would use a radio signal to make themselves heard. Did someone already study whether it would be easier to build a structure that modulates the brightness of the sun in some artificial way? You imply more accurate instruments may be on the way, is there anything in the pipeline? Also, more generally, can you comment on the theoretical and practical limits to the doppler and transit methods? you have posted comments at Cliscep. Technically, yes. There are attempts to use laser combs for wavelength calibration, which could make the radial velocity method very accurate. The problem is that we still don’t know quite how to remove the noise due to oscillations of the star itself. The surface of the star can oscillate with radial velocities of 10s of cm/s, which means that it could easily mask a signal from an Earth-like planet at 1AU around a Sun-like star. From space, the transit method is very sensitive. We’ve already found objects with radii less than that of the Earth. It may even be good enough to find systems with moons. In other words, a planet with a moon will not transit with a fixed period, because it will also be orbiting the common centre of mass of the planet-moon system. You could potentially detect such timing shifts. As I said above, a big issue with the radial velocity method is trying to reduce noise from the star in order to detect low amplitude radial velocity signatures due to an orbiting low-mass planet. An obvious problem with both is the more distant the planet from the star, the longer the orbital period, and the longer you have to wait. One reason Kepler may not have detected a true Earth analogue is that it lost too many of its guiding wheels and couldn’t remain on the same target field for long enough. An obvious problem with both is the more distant the planet from the star, the longer the orbital period, and the longer you have to wait. Presumably for the transit method, for planets further out, the relative angle of the plane of the orbit is critical; I’d have guessed that we would only detect a tiny proportion of earth sized planets in an earth distance orbit, whereas the doppler method would be much less sensitive to this (as it doesn’t require the planet to pass directly in line of sight of the star)? Isn’t it also the case that the radial velocity method alone will only give you the lower limit for the mass of the planet because of the ‘line-of-sight’ factor? Yes, the probability is R*/a, where R* is the star’s radius and a is the orbital radius. So, for a planet at 1AU around a 1 solar mass star, the probability is 1/200 (or, we would detect 0.5% of all such planets in a field if we could observe for a few years). Indeed, that is also true. The RV method gives Mp sin i, where Mp is the actual planet mass, and i is the inclination of the orbit, with 90 degrees being edge on. Of course, if a planet also transits, then you know that i has to be close to 90 degrees, and the mass estimate is going to be pretty close to the actual mass. ATTP: do you happen to know if there is a complete list of discovered exo-planets around? Is someone keeping track of them? Yes, I use the Exoplanet Encyclopedia. There’s also the Exoplanet Data Explorer. Great. Thanks for those links. I am getting back into hobby astronomy again and came across claims that some exo-planets can be detected with amateur equipment (using the transit method). That’s quite an exciting prospect, even though I am thinking more of looking at confirmed planets and not so much detecting new ones. In fact, the most successful transit project prior to Kepler (WASP) was done using Canon lenses bought off ebay. Do you use your own software to process the data and detect the transits or is there some open source package available to do this? On the WASP or superwasp sites I did not find anything. I actually haven’t done any transit work myself. My understanding is that you could almost do it in a spreadsheet and I think this planethunters site explains how to do it.